Juliana, South Carolina - USA AMAZING! Tried so many products for my eyes but these bright eyes cataract drops are the only ones that have worked. With these drops I saw a noticeable difference in my sight and my eye colour after 5 weeks! 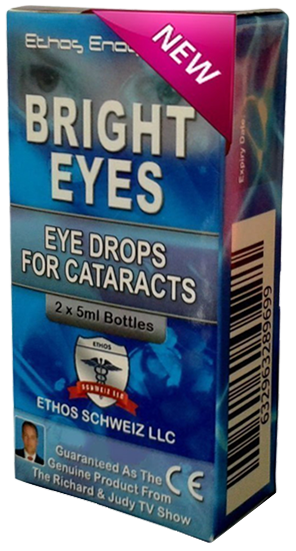 Cataracts, Glaucoma, Macular degeneration is very common worldwide and can be usually treated successfully with Ethos Bright Eyes (Nac) eye drops to keep your vision clearer and brighter. We suggest that looking after your eyes and health is the first step in understanding how to avoid surgery in one or both eyes. Having your eyes checked and making small changes to your lifestyle will help to reduce the risk of developing some eye conditions. 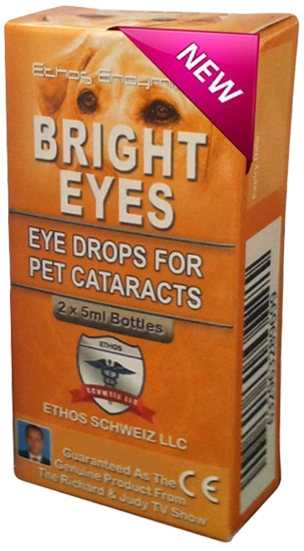 Ethos Bright Eyes eye drops for Humans and Pets have been our cutting edge natural health best seller product that featured on the Richard and Judy TV trails in the UK. We pride ourselves that we have been supplying for over 15 years worldwide. As well as using Ethos Bright eyes drops we suggest regular eye checks, keeping your eyes fully protected in the sun, eating healthy and having a more active lifestyle will have a positive impact on your eyes and overall health.